The American Association of Orthodontics recommends that all children be seen by the age of 8 for an orthodontic evaluation. Many adults, whose families couldn’t afford treatment as a child or didn’t want to wear braces, are now considering straightening their teeth to improve their appearance and long term dental health. Orthodontic treatment is quite common now among adults with many new treatment options available that are less visible such as clear bracesa and invisible braces. Feel free to contact our office for a complimentary consultation. Dr. Gordon Honig will inform you whether you or your child could benefit from orthodontic treatment, best treatment recommendations available to correct the individual problem, how long treatment will take, and discuss payment options to work within your budget. 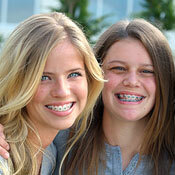 At Honig Orthodontics our goal is to help you create the smile you want and deserve for yourself or your child.